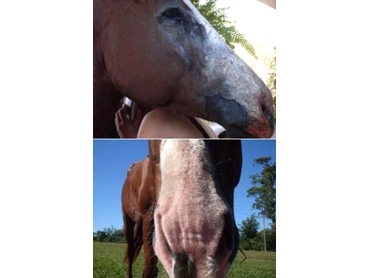 Heal with Ease recently supplied a homeopathic treatment for a horse suffering from mud fever and scalding. The owner of the horse, 'Cherokee' reported that the animal’s leg would not heal totally. It would come good for a couple of months, then the problem would reappear overnight. The owner suspected it might be mud fever in the leg’s white section. Then it affected his white blaze. The horse struck his head and, as result, his face peeled on top and his nose flared up. The horse’s owner was looking for a natural solution to the problems that had befallen her horse. Using homeopathic medicine, Heal with Ease were able to assist her to release the problems from inside, allowing for a full healing result. The owner was extremely patient and diligent and followed directions to the letter, resulting in the healing seen in the accompanying images. An impressive feature of homeopathic medicines is that most illnesses and injuries, named or not, can be treated by simply working on the presenting symptoms and taking into account the animal’s circumstances and environment.